When I weed a section of my garden, I leave no proverbial stone unturned – unless I can’t identify the weed and it looks, for one reason or another, like like one that has garden potential. Such has been the case with the mounds of moss-like leaves that sprouted and have been slowly growing at the ends of some beds in the vegetable garden. The plant hardly seemed menacing. And it wasn’t. The plant graduated out of the “weed” or “potential weed” category as a scattering of lemon-yellow flowers opened atop the mounds. Aha! 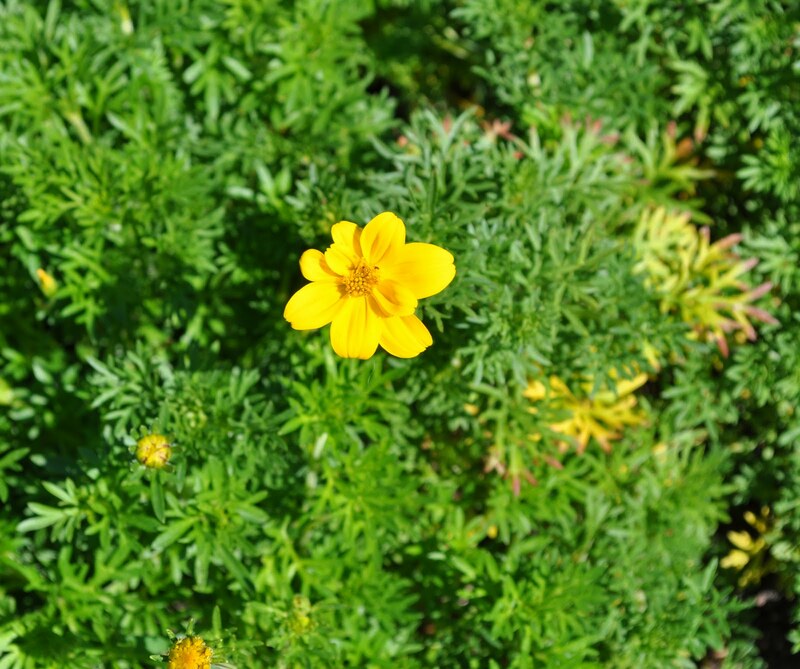 I looked back on my early autumn notebook entry of last year and identified this year’s plant as Goldilocks Rocks (Bidens ferulifolia), one of a few annual flowers that I received last year for testing. The plant bloomed nonstop all last summer, and has returned for an encore. The plant is sometimes billed as an annual, blooming from “planting until hard frost,” yet last fall, my plant kept blooming until temperatures dropped to 24° F. Sometimes the plant is billed as a warm climate perennial, hardy to 30° F., yet temperatures dipped to -18° F. in my garden last January. For one reason another, the plant returned without my doing. Snow cover may have kept the plant warm enough to act like a perennial that overwintered from last fall. Or new plants sprouted from self-sown seeds. In the latter case, which is more likely, I will add Goldilocks Rocks to my list – along with mache, dill, cilantro, breadseed poppy, dame’s rocket, cleome, and bush balsam – of friendly volunteers that annually show up in my garden. Pears in July? On July 11th, I was weeding around the base of a pear tree and came upon a few small pears on the ground beneath Blanquet Precoce (an old pear variety probably originating in Germany about 200 years ago). And they were ripe, overripe, in fact. I gathered them up from the ground and picked the few that remained on the tree. The worst of them was mealy, with pear flavor that was on the “sleepy” side. The best of them had firm texture and more lively pear flavor. Even at its best, Blanquet Precoce is not a very flavorful pear. Surely not one that would be worth growing if it ripened in late summer of fall, when other pear varieties are abundant. And, did I mention the fruit size? Very small, the size of a very small plum. Still, Blanquet Precoce is notable for, if nothing else, being a pear that is ripe in July. The flavor would probably be improved if it was picked at just the right moment. That moment is before it is fully ripe, after which it can finish ripening in a bowl indoors, off the tree. Some pears – and perhaps Blanquet Precoce is one of them – need a period of cool, refrigerator temperatures before they can be ripened at room temperature. Skill is needed to harvest and ripen a pear to perfection, and then, to quote Ralph Waldo Emerson, “There are only ten minutes in the life of a pear when it is perfect to eat.” I’ll give Blanquet Precoce another chance, next year. Diligence in weeding the vegetable garden throughout spring and early summer has paid off. The garden has few weeds now, and just a few minutes pulling a weed here and there now and then is all that’s needed to keep the garden free of weed problems. Without weed problems, the garden looks nicer, is more productive, and – very important – is ready to fill baskets, salad bowls, and the freezer with fresh vegetables from late summer on into autumn. As tomatoes, peppers, cucumbers, and other warm-weather vegetables of summer exit stage left in a couple of months, lush leaves of cabbage, kale, endive, and lettuce, and crisp roots of turnips, winter radishes, and beets enter stage right. The change is gradual, like a developing photographic film with the late summer and fall vegetables gradually coming into focus from among the fading tangle of summer vegetables. 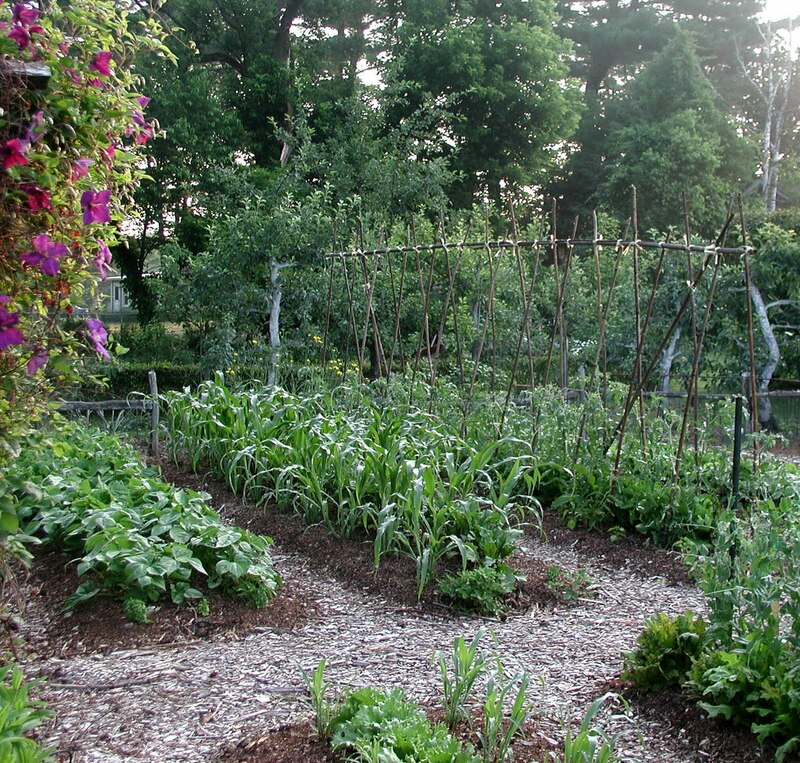 Enjoying the late summer and fall vegetable garden is like having a whole other vegetable garden with little more effort and no additional garden area; but it takes planning and planting. Endive, broccoli, kale, and cabbage seedlings are on their way, ready for planting out in couple of weeks. At that time, I’ll also be sowing turnips and winter radishes and, a couple of weeks later, spinach and small (spring) radishes. From now until early September, I’ll also be sowing and transplanting lettuce.